Season starts on Dec 10 and ends on Apr 22 (133 days). Average season duration in France is 118 days. Average snow depth during the season (Dec 10 to Apr 22) is 92 " at summit elevation and 11 " at base elevation. Snow coverage is usually best during March, offering an average snow depth of 106 " at summit elevation and 13 " at the base. Champagny en Vanoise features 68 sunny days on average per season. The average for all ski Resorts in France is 76 sunny days. February is the sunniest month with an average of 20 sunny days. The county Champagny, located in the French Départment Savoy, is luckily somewhat off the beaten mass tourism track. Unlike many French resorts Champagny has managed to retain its Alpine village authenticity and architectural integrity. Guests can experience the wonderful rustic-comfy cosiness and unspoiled ancient beauty which can be considered a rare treat! 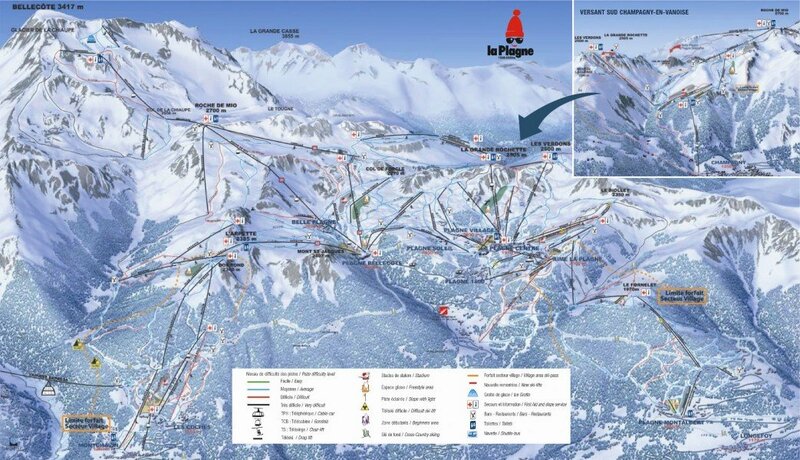 The village is located at an altitude of 1250m and gives access to the ski resort La Plagne which features a total of 225 km of trails and 108 lift facilities. The gondola takes you within 8 minutes up to 2000m. From there you have an abundance of diverse terrain at your disposal as well as terrain parks and even a halfpipe for snowboarders and “Air and Style” fans.